The End of Our Fourth Homeschooling Year! The boys and I finished up school today! (Woo-hoo!) I'm very thankful to report that this year's last day, unlike last year's, did not feature a tornado! I am working on a post about all the stuff we did this year, but I didn't have time to finish it. Hopefully, it will run tomorrow. Anna Maria, who is extremely devoted to the message of Divine Mercy and to the Blessed Mother, says young women should look to Jesus and Mary for help. "Mary was also a young girl, she was unwed, she opened herself up to have life and to give life to Jesus, in his human state," she says. "It probably wasn't the best time for her either because her response was a little startled. But she said yes to God." Anna Maria is hoping to encourage young women who are pregnant and scared to say yes to God and yes to life. Defenders of the Defenseless is a nonprofit 501 (c) (3) organization committed to protecting the right to life of all unborn human beings. Because we strongly believe in the immeasurable value of every human life, we have made it our cause to protect babies from being deprived of their Constitutional right to life, liberty, and the pursuit of happiness while in the womb. We wish to achieve this goal by publicly witnessing to the dignity of the unborn through pro-life billboards, advertisements, and educational materials. By sharing life-affirming messages in the local community, we seek to change hearts and minds and help strengthen a culture of life. Thank you to those of you who have purchased items from Amazon by clicking through from this site. I earn a small percentage of each sale and it goes a long way to helping support this blog. I thank you for your support from the bottom of my heart! I really enjoy Susan Hines-Brigger's columns in St. Anthony's Messenger. While the current issue's articles aren't on-line yet, I wanted to share with you this excerpt from her current offering, which she wrote on vacation with her family. It offers some important food for thought. We are each given a certain amount of time each day. Do we spend it on what matters? I, too, am guilty of losing perspective of what is truly important. If not, would I be sitting holed up in a bedroom on my vacation? Unfortunately, all too often, the mucky stuff of life seems to get in the way, and we become very narrow in our view of what's important. Suddenly, things like deadlines, a beautifully decorated home, prestige, titles, errands, and other day-to-day things start to take over. . . And before we know it, we lose all sight of the forest for the trees. . . Don't get me wrong, all those things have a time and place. It's just important to know when and where. Catholic Philosopher Chick Makes Her Début is the intelligent Catholic woman’s beach read. This book is so much fun that you won’t want to put it down until you have turned the last page with a blissful sigh of contentment! Rebecca Bratten Weiss and Regina Doman bring Cate Frank to life and make her a heroine you would want to share a slice of cheesecake with. Cate manages to balance weight issues, her love of good food, fashion disasters, a party-girl roommate, parents who think she has gone off the deep end, and her own natural inclination for getting into difficult situations, along with heavier philosophical concerns. On her journey, she will make some valuable friends and learn a few lessons about herself and her place in the world. One of my favorite lines in this book is when Cate muses, “Whatever God wants me to be, it must be something as unique as a snowflake.” Any woman who has struggled with what it means to be a Catholic woman today and what one’s individual vocation is will appreciate and sympathize with Cate’s inner turmoil. 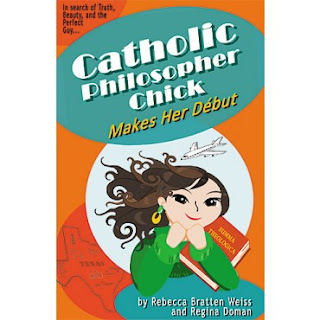 “Catholic Philosopher Chick Makes Her Début” is a great addition to the genre of Catholic fiction. Weiss and Doman make an incredible writing team, and one can only hope that more books of this quality will be coming our way in the future from this talented duo. I am happy to report that my mission to get rid of 40 bags of stuff out of home was completed this weekend. As I predicted, it did take about 6 months this time, but it still happened! We're still going, even though I'm not going to keep counting. And even then, we'll still have too much stuff! But, I made a dent in the ongoing battle! Sometimes I think in today's world we have lost sight of the individual person. It is all about the numbers - how many followers do you have? How many Facebook friends? How many people subscribe to your blog? No matter what business you are in, you need to have a "platform" and people paying attention.It is how we are told to measure success and our influence on the world. A certain parish sponsored an evening affair. But only a handful of people showed up. The woman in charge of the program was very disappointed. She complained about the poor attendance to the pastor. "Joan," he said to her, "Jesus said, 'Feed my sheep.' He didn't say, 'Count them.'" That is an important reminder for all of us. One person matters. If we touch one life, make one person's day a bit brighter, help one person with a problem or offer a word of encouragement, it matters. What can you do to make one person's life better today? Emily Stimpson, author of The Catholic Girl's Survival Guide for the Single Years: The Nuts and Bolts of Staying Sane and Happy While Waiting for Mr. Right , who is 36 and single, has written an insightful column for the National Catholic Register on what it means to be single and still waiting for the right person to come along. Our job isn't to fret too much about whether or not we'll still be single in another year - or 10. It's simply about being in the day, giving thanks for the present blessings and focusing on the present tasks. It's also our job to cultivate a spirit of hope. No matter how old we are, if we believe we're called to the vocation of marriage, we can never stop hoping God will send the right someone along. . . Grace is at work all around us, which means the only expiration date on a vocation to marriage is death. . .
Hope is what keeps us going after a breakup or when we feel like the last single person standing. Hope is what allows us to trust that God really does know what he's doing. We live in a noisy world (both the "real" world and the virtual one). While it is important to communicate and to promote the faith, it is also important to realize that there is a need to be silent and pray and reflect. This blog will be joining the Catholic Media Promotion Day and will go silent tomorrow (Wednesday). World Communication Day was this past Sunday and Pope Benedict XVI issued a message regarding the value of silence: Silence and Word: Path of Evangelization. 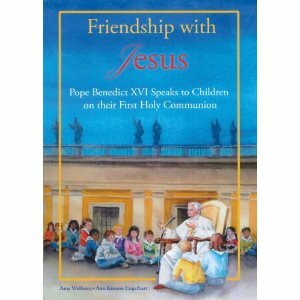 I haven't read Friendship with Jesus: Pope Benedict XVI Talks to Children on Their First Holy Communion , but I saw it advertised, and truly, anything concerning Pope Benedict XVI and edited by Amy Welborn has to be good! In this beautifully illustrated book, Amy Welborn, well-known author and blogger, introduces Pope Benedict's profound yet simple answers to various questions put to him by children in Rome who had recently made their First Holy Communion. Pope Benedict's answers, and the children's wonderful questions concerning this very important spiritual occasion in their young lives, provide inspiring text for this beautiful gift book for First Communion. I believe parents have the right to make the decisions that they feel are best for their children and their consciences. My children are fully vaccinated. Grave reasons may be morally proportionate to justify the use of such “biological material”. Thus, for example, danger to the health of children could permit parents to use a vaccine which was developed using cell lines of illicit origin, while keeping in mind that everyone has the duty to make known their disagreement and to ask that their healthcare system make other types of vaccines available. Moreover, in organizations where cell lines of illicit origin are being utilized, the responsibility of those who make the decision to use them is not the same as that of those who have no voice in such a decision. We can therefore state on moral grounds that while we do have a responsibility to object to the fact that the vaccines were made using these methods, we can make the decision to use them for the well-being of our children and society at large. As I reflected on this issue, I tried to find a moral comparison. The one that kept coming to mind was organ donation. If a person is murdered, that person’s organs can still be donated (provided she was not murdered for the purpose of obtaining her organs). Would the recipient be considered a cooperator with evil because he benefited from the wrongful death of another? No. In fact, the gift of organ donation can be considered to bring a good out of a very bad situation. In the case of these murdered unborn children (in 1964 and 1970), the decision had already been made to murder them. That is the horrible reality. Using the tissue from them does not change that initial evil, but is it possible that, like an organ donation, the vaccines brought some good to the world? Perhaps an ethicist can answer that question for me. In terms of moral responsibility for the evil incurred in this chain of events, even the Vatican states that a parent who chooses to use these vaccines holds a very small level of responsibility. I certainly do not advocate the committing of sin, but the reality is that despite our best efforts, most of us, myself included, have committed more evil in thought, word, and deed, since we got up this morning. Perhaps considering the wider implications of public health if we refuse these vaccines, our energy in avoiding evil could be directed to more immediate concerns. As for the practical question of whether to refuse to vaccinate one’s children for this moral reason, as the Vatican has stated, one does have the right to do so. However, vaccines work because a majority of the population is vaccinated. If the number of those who refuse to vaccinate their children increases, that protection will be lost and those diseases we consider eradicated can return. Those who choose not to vaccinate their children are protected because I chose to vaccinate mine. They are still benefitting from the vaccines. This is something I have written about before, but it bears repeating. When you live a generous life (whether it be with money or time), God allows you to do more with what is left. The urge is always to cut back on charitable giving when money gets painfully tight, but I have found that those are the times I actually need to give more (at least percentagewise). Sadly, I have yet to make it to the Biblical 10 %, but I keep aiming for it. 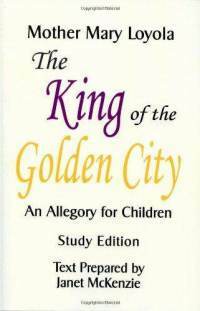 I read "The King of the Golden City" with my children this year as part of our homeschool religion program. It had come well-recommended by friends, and as I read this aloud with my boys, I completely understood why. This story was originally written in 1921 by Mother Mary Loyola of the Bar Convent in York, England, in response to a student's request for a story to help her prepare for her First Holy Communion. While this story can certainly help prepare one for that special event (and all the Communions that come after), it is more accurately described as a preparation for life. My children are quickly embarking on that stage of life where they will make so many decisions about the course that their life will take. They will face peer pressure and the call of the secular world and all the "goods" that the world can offer. This book illustrates all of those temptations, and the importance of focusing on what matters. Even as an adult devoted to serving God, I found much to take away from these pages. The story of young Dilecta and her visits from the King as He desires to bring her closer to Him tells of the desire of Jesus for each of us. My children easily picked out the majority of the allegorical images. What they didn't understand at first reading, I was able to help them with. There is also a very helpful study guide included, which can be adapted as needed for the age of the reader - from child to adult. This makes an excellent read-aloud book, even for children old enough to read well. Reading it aloud allows it to be discussed as needed. We read two chapters per week, once a week. My children looked forward to it every time. I highly recommend this book, either as part of a homeschool program, or simply as part of family faith formation. Looking for a Place to Stay on Vacation This Summer? This one came to me courtesy of Catholic Digest. Looking for someplace other than a chain hotel to stay while on vacation? www.goodnightandgodbless.com/accommodation.html offers listings of abbeys, convents, and monasteries all over the world that open their doors to travelers. Courage in Chaos: Wisdom for Francis de Sales is part of the Classic Wisdom Collection published by Pauline Books. The purpose of the series is to offer guidance for today's challenges by offering excerpts from works by prominent Catholic saints. St. Francis de Sales was born into a French noble family in 1567. He became a priest and served as a missionary in Le Chalbais in Savoy to help bring Calvinists back into the Catholic faith. At age thirty-five, he became the Bishop of Geneva-Annecy. He wrote "An Introduction to the Devout Life" and "Treatise on the Love of God," as well as over 20,000 letters. With St. Jane Frances de Chantal, he founded the Visitation Sisters. "Courage in Chaos" offers excerpts from St. Frances de Sales' writings gathered around themes such as "Be Just and Fair," "Be Not Too Anxious," "Do Small Things with Great Love," "The Need for Patience," and "Be Content." The compiler, Sr. Kathryn Hermes, has selected many pearls of wisdom, such as "Great works do not lie always in our way, but every moment we may do little ones with excellence, that is, with great love," and "Lose no occasion, however trifling, of exercising sweetness of heart toward anyone." There is much practical advice contained within these pages. In her foreward, Sr. Hermes writes that she first discovered St. Francis de Sales in the 1960s - a time of turbulent change. She states that "Francis and his writings were balm to my spirit during a time that tried us all." And so, she offers his wisdom for readers today, during another time of change and chaos. "Courage and Chaos" is not geared for spiritual beginners, but rather for those who have taken a few steps on the spiritual journey. St. Francis de Sales does, however, have much to say to those who are trying to live a God-centered life in a crazy world. This review was written as part of the Catholic book reviewer program from The Catholic Company. Visit The Catholic Company to find more information on Courage in Chaos: Wisdom from Francis de Sales. They are also a great source for a baptism gifts or first communion gifts. I finished up my major project yesterday (at least for the time being), so the plan is to get back to my regular blogging. I do realize the world continued to turn quite nicely without my input in this little corner of cyberspace, but this is one way I try to use the gifts God gave me. What happens after I write them . . . well, that is up to Him! Speak up. Pay a mom a compliment about her child. People always seem quick to point out what kids are doing wrong. Turn the tide and point out things like how kind their child is to yours. Be kind to ourselves. Try not to play the compare-and-contrast game with your fellow moms. Each child is an individual, so don’t worry if you do things differently from other moms. You know your kid best. Say a prayer for your fellow moms. Every mom has her own story and struggles. Don’t discount that fact. Rather than tear our fellow moms down, lift them up to face the challenge motherhood presents. Be the bigger person. When you hear people trashing a fellow mom — or dad, for that matter — speak up. I know it’s easier to just go along, but I’m sure you would want someone to stick up for you in that situation. Remind them that there are no perfect parents. Enjoy your blessing. The privilege of being a mom really is a blessing, one which not everyone is able to receive. Be aware of that. Recognize how truly blessed you are not only on Mother’s Day, but every day. Please read the full article here: Mothers Unite! Catholic Family Fun Book Tour! 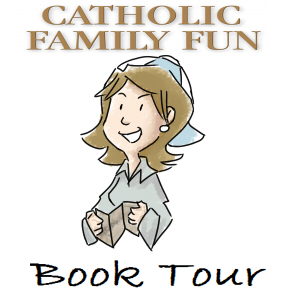 I'm excited today to be part of the Book Tour for Catholic Family Fun by Sarah A. Reinhard. As parents, we have so many responsibilities when it comes to our children. We need to feed, clothe, and nurture them. We need to raise them in the faith and make sure that they are educated. But in the midst of all those responsibilities, it is also important to have fun as a family. Moments of joy and laughter can create lasting memories for both you and your children. Laughter can reduce tension and stress which can help make the challenge of parenting a little bit easier. But, in the midst of our busy lives, where should we begin? How can we incorporate more fun into our family lives without it being just one more thing to add to our lengthy to-do lists? Sarah Reinhard comes to the rescue with her new book: "Catholic Family Fun: A Guide for the Adventurous, Overwhelmed, Creative, or Clueless." Reinhard aims to "join [the] beauty of Catholic faith with the fun of family life, and create a set of activities that you will experience as both memorable and instructional." With chapter headings such as "Silly Things to Do Together," "Story Starters," "Craft Projects," "Meals to Share" and "Places to Go," this book is a treasure-trove of ideas to create fun-filled days for families with children of all ages. While Reinhard has included a "faith angle" with each activity, there are also chapters dedicated to fostering the faith life of your domestic church. She offers ways to incorporate celebrating saint's days, suggestions for serving others, and means to foster a family prayer life. This book also has an accompanying website - www.catholicfamilyfun.com - which features more fun suggestions, web resources, a fun for the month feature, and a place to share ideas. is a great resource for all Catholic families seeking to bring a little more joy and laughter into their lives.